Shopping by virtual party: does it really work? It seems to be on the iPhone app Poshmark (soon to be on iPad and Android and web as well), where the average user engages seven times a day for 25 minutes total, shop each other's closets, and communicate with each other about their items. Here's a quick snapshot of how it works. Poshmark takes 20% of the final sale price for items that sell, and the app asks users for the item's original retail price so users can see how much of a deal they're getting. Poshmark provides sellers with a pre-paid, pre-addressed label after they've made a sale; it holds payment until the buyer tells the company they've received their order (the familiar service BuySafe plays a role here) - only then does Poshmark release payment to the seller. We talked with Tracy Sun, co-founder and Vice President of Marketing for Poshmark, to find out what the closet-shopping and partying buzz is all about, and just how women (and men!) can use the app, make money, and get in on the fashion fun. EcommerceBytes: Can you tell me a little about who is behind Poshmark, and the story of how it was started? Tracy Sun: Our goal at Poshmark is to help women across the country put their closet up for sale. 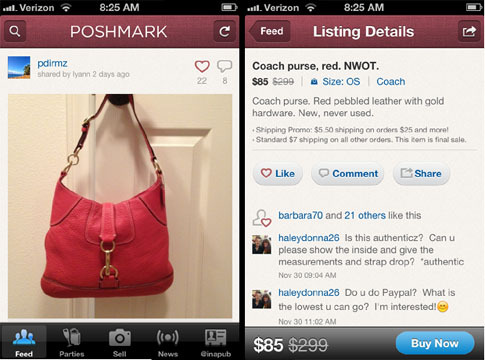 Poshmark began by applying innovation in technology to real-world problems faced by women today. 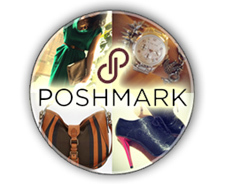 With Poshmark, we are helping women unlock the value of their closets. The team is comprised of entrepreneurs and engineers passionate about the intersection of technology and fashion. EcommerceBytes: Is Poshmark only available for iPhone now? If so, any plans to make in available to Droid phones and/or tablets? Tracy Sun: Currently, only iPhone users can put their closets up for sale on Poshmark. We have started to make shopping these closets available on the web at Poshmark.com. You will see a more robust web experience as well as expansion to Android and iPad devices in the upcoming year. EcommerceBytes: It looks like you're trying to put fun in it by having people sell via virtual "parties" that are for certain brands. Can you elaborate on the concept and what makes it different from other selling apps? Tracy Sun: We built Poshmark with an eye towards making selling simple and fun. After all, who has time for more chores? Our "Posh Parties" help inspire women to list items from their closet together. It is these social connections and friendships between members of our community that is unique to Poshmark. Also, we are the only marketplace built from the grounds up for the mobile device. Our mobile-first strategy has led to massive levels of engagement within our community. EcommerceBytes: How can people buy and sell on Poshmark? Is it either via the feed or by attending a party? How long do the parties usually last? Tracy Sun: Users create a listing using the app. This is really easy and can be accomplished in less than 60 seconds. Then, if there is a party going on, they can share their listing to a party if they wish. Currently Poshmark holds 3 parties a day. Each party lasts for 2 hours. 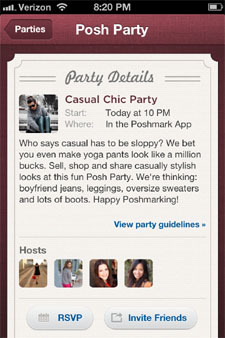 EcommerceBytes: How does one participate in a Poshmark party? For example, if I wanted to attend the Handbag and Accessories party today, how do I sign up and list items? Tracy Sun: In order to attend a party, you simply go to the parties tab in the app and click on the party that is happening. From there you can shop and share listings and also interact with others at the party through their listings. You can also shop all the listings from any previous party whenever you would like. EcommerceBytes: Can people also trade/swap items if two users agree on it? Tracy Sun: At this time, we do not recommend or support trades and swaps on Poshmark. The reason is that we have a program in place called BuySafe where we keep the buyer's payment safe until they tell us that they have received the order. Only then do we release the payment to the seller. With BuySafe, we stand behind every purchase made on Poshmark so our community can shop with confidence. When users trade or swap, they take the transaction into their own hands and we cannot support them if something goes wrong. This is why we don't recommend it. EcommerceBytes: Are the items both pre-owned and new on Poshmark? EcommerceBytes: Can you give out any metrics about Poshmark, such as how fast it is growing or number of users? Tracy Sun: Poshmark is a social community with over two million monthly interactions between members as they shop, share and communicate with one another about their closets. Users add items from their closets to the marketplace at the rate of $100 million a year, making Poshmark's virtual inventory more robust than most physical retailers in the U.S.
EcommerceBytes: Are the photos on Poshmark taken by cell phone cameras? Is there a way to upload pix from other digital cameras? Tracy Sun: You can use either photos taken from your cell phone, or from the camera roll on your phone. So, yes you can save photos from other sources into your camera roll and use these for your listing photos. Read EcommerceBytes interview with a Poshmark "featured" user.